Abstract: European and APJ businesses may know Vembu, but many U.S. IT organizations will be surprised by the solution set of this ten-year-old company that is launching its first concerted marketing push into North America. In 2015, Vembu—newly based in Dallas, Texas—may become “one to watch” as it matches its features impressively to what IT organizations are looking for in a modern backup solution. It’s no secret that, as IT organizations continue to modernize their production infrastructures, antiquated legacy approaches to protecting those infrastructures can quickly go from barely adequate to completely insufficient. 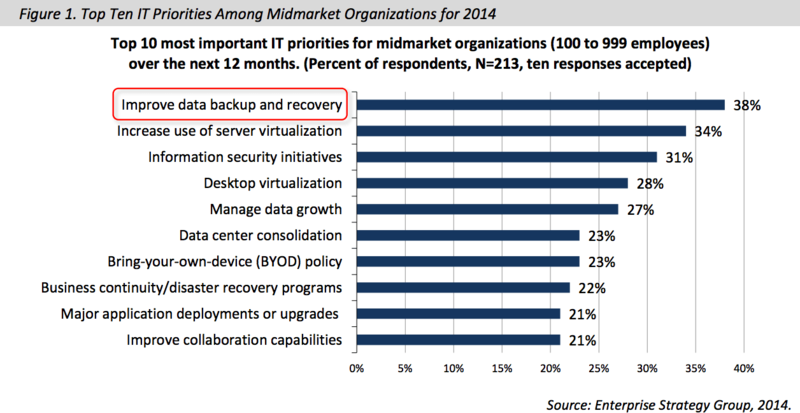 In fact, in ESG’s IT spending intentions research for 2014, improving data backup was the top-cited IT priority by midmarket organizations (see Figure 1). 1 And for the past three years running, improving data backup and recovery has been one of the top three most-mentioned priorities for organizations of all sizes. IT professionals often believe they have only two groups of data protection solutions to choose from: all-encompassing products that everyone has heard of, or point products designed to protect one particular platform, workload, or scenario (perhaps specific to cloud backup, virtual-server backup, etc.). Even worse, those two backup solution “types” wane further when it comes to products right-sized for small to midsize businesses (SMBs). These are the problems that data protection vendor Vembu is trying to solve. In the U.S., even seasoned IT managers usually haven’t heard of Vembu—a decade-old data protection company with nearly 300 employees (who until recently were almost all based outside the U.S.). A remarkably high 65% of the employees at this engineering-driven company focus on R&D. Of course, Vembu hasn’t been completely absent from the U.S. stage; it has been “working undercover.” It cultivated relationships with 4,400 channel partners—70% in North America, 20% in Europe, and 10% in Asia-Pac. The rebranded Vembu solutions that those providers sell protect data for about 60,000 businesses worldwide. Until now, customers were coming to Vembu through reseller word of mouth or by “finding” Vembu by themselves. Vembu wants to do more to let people know that it exists—it wants its own name to be in the marketplace and attached to its products—especially after hearing from many customers who desire to know whom the products they rely on truly belong to. So, in the past year, Vembu established relationships with more VARs and reached out directly to select enterprise and midmarket segments. It added 400 channel partners, 180 VARs, and 300 customers in 2014 alone. So really, Vembu is actually “new to” only two things: (1) marketing itself directly to the North American IT ecosystem, and (2) the idea that data protection should be complicated and expensive. The modern SMB needs robust virtualization- and application-aware protection. Vembu BDR provides native hypervisor support for VMware, Microsoft Hyper-V, and Citrix XenServer, as well as application support for Microsoft SQL Server, MS Exchange, MS SharePoint, MySQL, and Oracle. The modern SMB needs endpoint protection suited to a heterogeneous environment. Vembu BDR provides native block-based and file-based protection for Windows, Apple iOS, and Linux machines. The modern SMB needs data deduplication. Because everyone’s (including SMBs’) data is growing at a far faster rate than their data protection and IT budgets can scale with linearly, deduplication of secondary data is vitally important. Vembu BDR performs both data deduplication and data compression within a local Vembu backup server and within Vembu’s cloud-storage container. The modern SMB should leverage the cloud. SMBs need to focus on their business overall, not on the business of running IT. The reality is, when (not if) “bad things happen” to an SMB’s IT operations, the business’s operations can come to a halt, too. Ensuring that data will survive in an efficient, recoverable manner goes far toward ensuring that the business as a whole will be able to survive, too. That is why the cloud really should be part of almost every SMB’s data protection strategy. Midmarket organizations are looking for cloud-extended protection. Organizations (midmarket or any size) that are considering the cloud as part of their data protection strategy should look to a disk-to-disk-to-cloud (D2D2C) solution. In this approach, production data is first protected to an onsite backup server, and then is replicated to a cloud storage service. Vembu BDR does just that. Small businesses are looking for backup services. Small businesses in particular like the idea of backing up directly from their production server(s) to the cloud (D2C). The approach reduces on-premises costs while allowing restoration directly from the cloud copy of the data. Again, Vembu does this job—for as little as two dollars per server, per year, plus the cost of storage. Many organizations are scrutinizing file sync and share. These organizations have struggled to enhance users’ productivity via online file synchronization and sharing services, while still maintaining secure access through IT. Vembu offers “file sync and share” that is integrated into the backup management console. Every organization needs good disaster recovery. Most organizations realize that if their IT “goes away,” so does their business. That’s why midsize organizations not only prioritize the tactical aspects of improving data backup, as Figure 1 showed, but they also want to satisfy a strategic need for business continuity and disaster recovery. Like backup, BC/DR is prominent on the 2014 top-ten IT priority list, with 22% of surveyed midsize respondents citing it. ESG continues to see that the best opportunity for a midsize organization to achieve its BC/DR goals is through cloud services: Data is stored safely in the cloud, and VMs and their business services also can be resumed from the cloud. And yes, Vembu offers this service, too. Some companies end up with as many as four or five backup vendors following their extended efforts to protect “everything.” For example, a company may use one vendor’s offering for virtual-server protection, a different vendor’s product for physical server protection, yet another vendor’s product to back up employee endpoint devices, and still another vendor (an MSP this time) to provide cloud-based backup and recovery. Vembu BDR is one product that can back up all those platforms and environments in native format and can restore data instantly. In a nutshell, that’s why Vembu customers and prospects say they find this product compelling. Ultimately, Vembu BDR can reduce total cost of ownership. As compelling as the feature set shown in Figure 2 appears, Vembu understands that the real power of software is best understood through first-hand evaluation. Similarly, ten years ago, what IT used for business was often considered good enough to use at home on desktops. Today, “prosumer” trends often start with “what is good enough for desktop protection might be evidence to try on our servers.” To that end, Vembu’s endpoint product (desktop and laptop) is available without charge. 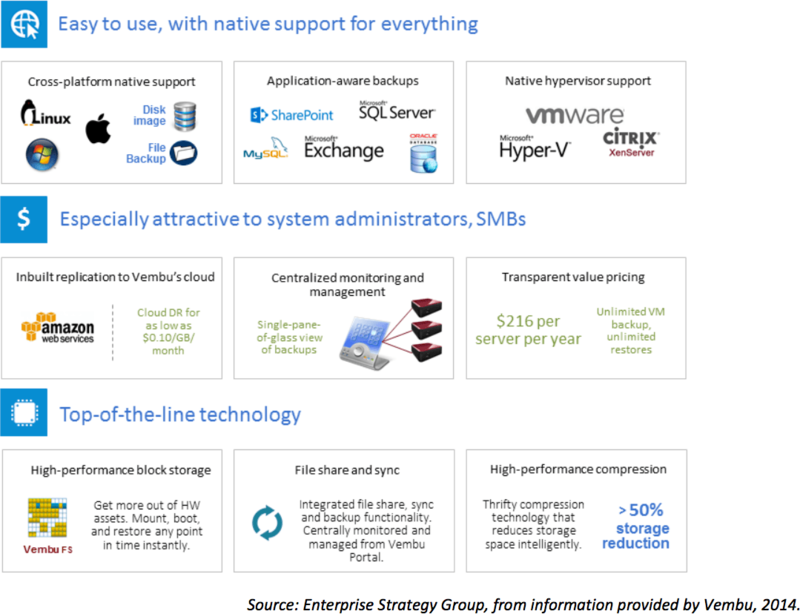 In addition, as the industry continues to show convergence between backup-as-a-service (BaaS) and enterprise file sync and share (EFSS), it shouldn’t surprise folks that BaaS solution providers such as Vembu also offer EFSS capabilities—and those capabilities are best delivered together for a comprehensive BaaS-plus-EFSS experience that is led by IT but delivered with user usability in mind. Vembu only charges for the storage consumption costs ($0.20 per gigabyte per month). Both of those offers are examples of Vembu’s effort to accelerate its direct marketing push in 2015. It is giving prospects who are unfamiliar with Vembu an appealing way to try certain products for essentially no cost. Vembu expects those users will get a first-hand sense of the products’ quality—and if they are sufficiently convinced, they may decide to move forward with purchasing other Vembu solutions, too. If it appears that this analyst is impressed with Vembu, he is. Vembu’s feature set surpasses what one might presume to come from a backup company that most folks (in North America at least) haven’t heard of. And although it would be easy to assume that some of Vembu’s capabilities are mere boasts, the hesitations wash away with the recognition that this is a vendor with ten years in the business, and that well over half its workforce are R&D engineers. Said another way, Vembu appears to have been quietly solving its customers’ backup challenges for more than a decade through technology, instead of marketing. Vembu appears to have been quietly solving its customers’ backup challenges for more than a decade through technology instead of marketing. In fact, not only did Vembu not have a marketing team until this year, but it also didn’t have a sales team to speak of. This is an incredibly engineering-focused company—one whose revenues and customers have accumulated through word of mouth. But now, Vembu is building out a solid U.S.-based sales and marketing engine focused on penetrating awareness among IT decision makers, especially decision makers in the SMB segment. The product Vembu will push in 2015, BDR 2.0, could be a “game changer” for Vembu’s growth. BDR appears to have the potential to quite effectively address the varied requirements of small and midmarket businesses who run mixed physical and virtual IT environments and who also want to leverage the cloud. If Vembu continues to invest as much into its North American marketing and channel outreach programs as it historically has invested into engineering its technology, then 2015 could be the year that a lot of SMBs discover the “secret” to solving a lot of their backup problems.